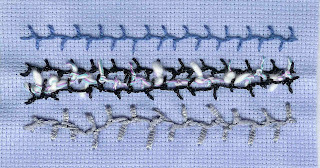 TAST - Knotted Cretan Stitch. Mmmm well. I wasn't very inspired by Cretan stitch so the knotted variation didn't do much for me either. The top row doesn't even look to me as though it has knots in it though I know it has. However by the time I got to the third row it was improving and the knitted ribbon I used there really showed the knots though you can't see them very clearly here. Now that we're this far into the challenge I'm starting to get a very useful library of stitched samples which are all filed in plastic wallets with the stitching guides in a ring binder. I was always intending to try out different stitches but never got around to it so this challenge is definitely a way that works for me. Lynne thanks for dropping by and leaving a comment.You aren't going to believe it but I keep my samples the same as you do. This sample looks good and I can see the knots. Like you I am enjoying doing the different stitches in TAST.